55-2973 at Downsview shortly before delivery flight. N94472 a recently de-mobbed U.S. Army U-1A Otter. C-GQDU at with PZL 1000 engine. • 55-2973 United States Army. Designated YU-1-DH. Tail No 52973. Initial unit, 521st Engineer Company, Crissy Army Airfield, San Francisco part of the 30th Engineer Group. Delivered 28-Feb-1955. Note: Utilised in Survey work in the area north of the Brooks Range, AK. • N94472 Fort Wainwright Flying Club. Fairbanks, AK. Dates unknown. • N94472 Civil Air Patrol (CAP) Rocky Mountain Region of the CAP, based at Denver, CO. From Aug-1977. • C-GQDU Sioux Narrows Airways Ltd., Winnipeg, Provisional Certificate of Registration and Flight Permit issued on 28-Feb-1979. • C-GQDU Buffalo Airways Ltd., Whitehorse, YT. Based Fort Smith NT. Regd 01-Jun-1979. Incident: un-named lake NT. 16-Feb-1981. Aircraft force landed after an engine fire and smoke entered the cockpit. Aircraft repaired. • C-GQDU Sabourin Lake Airways (Sab-Air), Cochenour, ON. On lease Summer 1981 Canx 27-May-1983. • C-GQDU Parsons Airways Northern Ltd., Flin Flon, MB. Dates unknown – until end 1985. • C-GQDU Athabasca Industries Ltd., dba Aero- North Aviation Services. Stoney Rapids, SK. Canx 31-May-1988. • C-GQDU 239665 AB Ltd., Calgary, AB. Regd 03-Jun-1988. Canx 22-Jun-1988. • C-GQDU Air Saguenay (1980) Inc., Jonquière. QC. Based Lac St. Sebastien, QC.05-Aug-1988. Canx 23-Apr-1999. Note: Converted with the Polish PZL 1000 hp engine. Date currently unknown. • C-GQDU Air Saguenay (1980) Inc., Chicoutimi, QC. Based Lac St. Sebastien, QC. Canx 23-May-1959. • C-GQDU Air Saguenay (1980) Inc., Jonquière, QC. Based Lac St. Sebastien, QC. Re regd 02-Sep-2003. 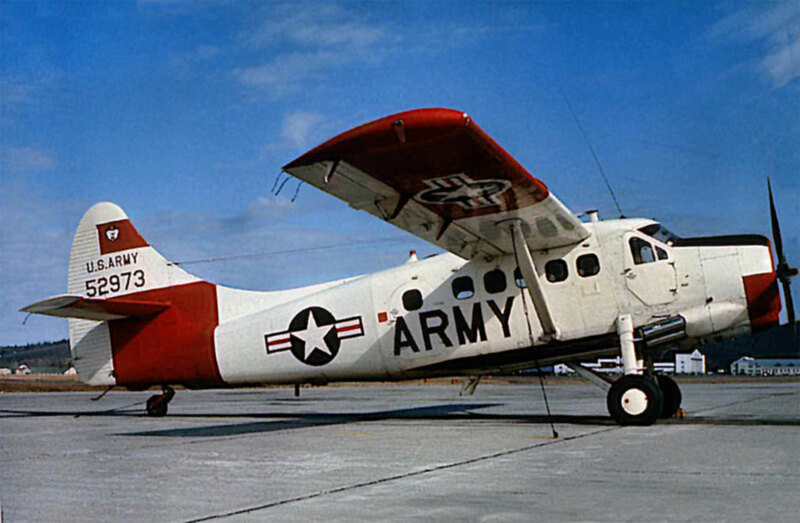 Otter number 43 was one of a batch of six Otters ordered by the United States Army, an “off-the-shelf” purchase as these aircraft were urgently required to assist in a survey of Alaska. It had originally been intended to designate the Otter in Army service as the C-137, and these six Otters actually carried the C-137 designation on their Technical Data Blocks when delivered, the only Army Otters to do so. They were in fact designated YU-1-DH and allocated serials 55-2973/78, painted on the aircraft tails as 52973/78. All six were painted in an all-white scheme with arctic red tails and wings. Otter number 43 was allocated tail number 52973. The last of the batch 52978 was handed over to the Army first, at a ceremony at Downsview on 25 January 1955 and training of Army personnel on the new type commenced at Downsview. Four more were handed over on 28 February 1955 (52973, ‘974, ‘976 and ‘977) and the final aircraft (52975) on 14 March 1955. On that day there was an official ceremony of acceptance of the six aircraft at Downsview, after which all six set off together on their delivery flight to their unit, the 521st Engineer Company, part of the 30th Engineer Group. The six Otters flew across the country to their new base at Crissy Army Air Field (AAF), San Francisco at the water’s edge near the south side of the Golden Gate Bridge. After a further period of training and familiarisation at Crissy AAF, the six Otters were flown to Alaska in two flights of three in April 1955, routing first to Idaho Falls, then Great Falls, Montana – Edmonton, Alberta – Whitehorse, Yukon Territory to Ladd Field, Fairbanks, Alaska. Throughout the summer and autumn of 1955, 52973 and the other five Otters operated on floats north of the Brooks Range supporting the survey work. Main base was at Umiat, with a secondary base at Kotzebue. As well as mapping and photographic work, the Otters were used to re-supply the field parties, who were working with their helicopters out in the bush. At the end of September ’55 the Otters made the long return flight back to Crissy AAF., San Francisco. The following month the 521st Engineer Company relocated to the Sharpe General Depot at Stockton, California. That winter of 1955/56 the six Otters took part in various evaluation exercises and during 1956 were used for survey work in the deserts of Arizona, California and Nevada. The operations of the 521st Engineer Company were scaled down during 1957, as its tasks were completed, and the unit was formally inactivated on 24 June 1958. Most of the Otters were transferred to other topographic units. It is not known to what unit 52973 was assigned immediately after the 521st Engineer Company but by July 1961 it had joined the 12th Aviation Company when that unit arrived in Alaska, based at Fort Wainwright near Fairbanks. Throughout its Army career 52973 would remain in the white/red scheme, never appearing in the olive drab of so many other Army Otters. Being one of the first six YU-1-DHs, 52973 had some minor differences from the standard Army U-1A, which were noticeable when it sat on the ramp at Fort Wainright alongside the rest of the Company’s aircraft, which were all U-1As. It had a Hartzell counterweight propeller, to be contrasted with the Hamilton Standard Hydramatic propellors of the U-1A. It had an angular pitot tube on the left wing, compared with the flowing curves of the pitot tube on the U-1A. 52973 continued to serve the 12th Aviation Company until August 1972, when it was transferred to the 568th Transportation Company, also based at Fort Wainwright. It was named “Ramblin Rose”. 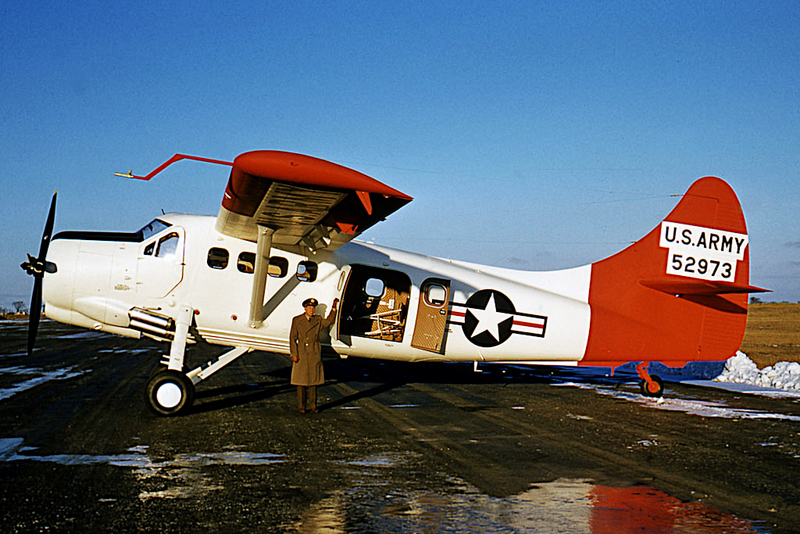 The Otter flew for the 568th Transportation Company until September 1973, when it was passed on to the Fort Wainwright Flying Club and registered N94472. 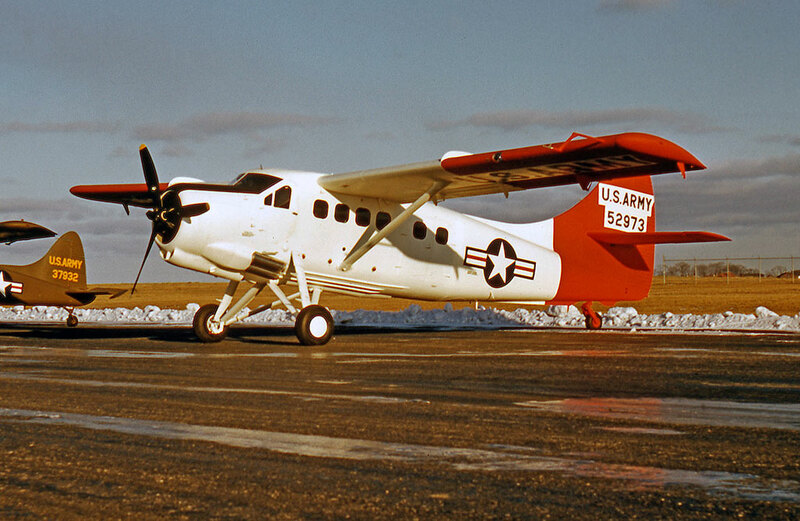 As such it continued to be available to aviators at Fort Wainwright for the next three years, until it was transferred to the Civil Air Patrol (CAP) in November 1976. It was at Boeing Field, Seattle during April 1977, still painted in the white/red scheme, being prepared for service with the CAP. It retained the registration N94472 and was assigned to the Rocky Mountain Region of the CAP, based at Denver, Colorado. It served here for more than a year, before being put up for sale. The purchaser of the Otter was Sioux Narrows Airways of Winnipeg, to whom a Provisional Certificate of Registration as C-GQDU and Flight Permit was issued on 28 February 1979. The ferry flight was from Denver, where the Otter had been based, to Calgary, Alberta, where the aircraft was refurbished and civilianised. Sioux Narrows Airways had been founded by Warren Plummer to serve his fishing lodges in the Northwest Territories. The Otter however did not enter service with Sioux Narrows Airways but instead went on lease to Buffalo Airways Ltd., and was rolled out of the hangar at Calgary after painting into Buffalo’s green and white colours on 25 May 1979. 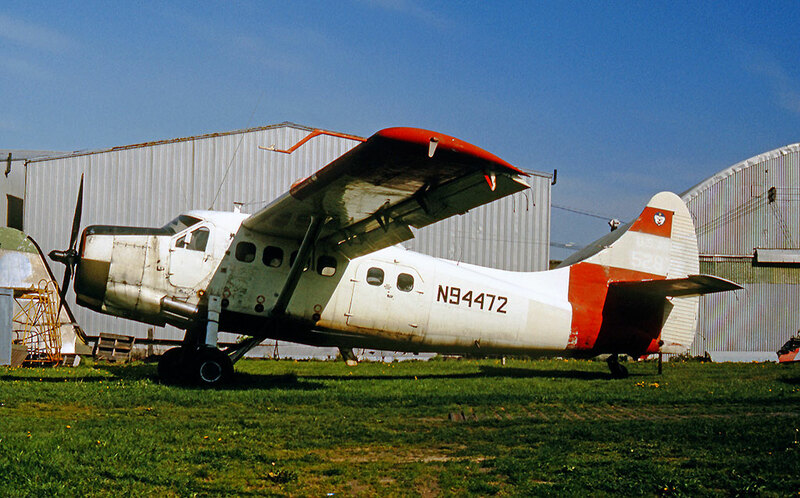 The FAA registration had been formally cancelled on 2 May 1979 and the Otter was registered to Buffalo Airways Ltd., as C-GQDU on 1 June 1979 and delivered out of Calgary two days later to the Buffalo base at Fort Smith, Northwest Territories. It was the only Otter flown by Buffalo at the time, and that well-known bush aviator “Buffalo Joe” McBryan and the other company pilots flew QDU serving the NWT until an incident on 16 February 1981 when the Otter force-landed on an un-named lake after an engine fire and smoke in the cockpit. The damage was repaired but that incident marked the end of QDU’s service with Buffalo Airways. It was replaced by Otter C-FQOR (392). The next operator of C-GQDU was Sabourin Lake Airways (Sab-Air) of Cochenour, Ontario who flew the Otter on lease during summer 1981, alongside their own Otters C-GPHD (113) and C-FVQD (466). The Otters were used to service native settlements and for tourists, fishermen and hunters. The registration of the Otter to Sab-Air was cancelled on 27 May 1982 and C-GQDU was then sold to Parsons Airways Northern Ltd., of Flin Flon, Manitoba who were to operate the Otter until the end of 1985. It was one of nine Otters flown by Parsons Airways Northern over the years, serving the bush country of northern Manitoba. It then went to Aero North Aviation Services (Athabasca Industries Ltd., DBA) of Stony Rapids, Saskatchewan, serving the bush country of northern Saskatchewan. It flew frequently based out of Uranium City. It was painted white with a double red cheatline. It was flown by Aero North until its registration to the company was cancelled on 31 May 1988. While with Aero North it was configured with small vertical fins on the rear stabiliser and no dorsal fin, but this modification was deleted when it was sold. QDU was sold to Rocky Mountain Aircraft of Calgary (239665 Alberta Ltd), an aircraft maintenance company, and was registered to that company from 3 to 22 June 1988 while it was being refurbished for sale on. Its new owners were Air Saguenay (1980) Inc., of St.David-de-Falardau, Lac St.Sebastien, Québec to whom it was registered on 5 August 1988. It went to Airtech at Peterborough, Ontario where it was converted for Air Saguenay with the Polish PZL 1000 hp engine and painted red overall with a white cowling and cheatline. It then entered service as part of Air Saguenay’s large Otter fleet, serving the bush country of Quebec. By 2001 it had been repainted into the new Air Saguenay colour scheme, which was a modification of the original scheme featuring a white goose motif at the rear fuselage. 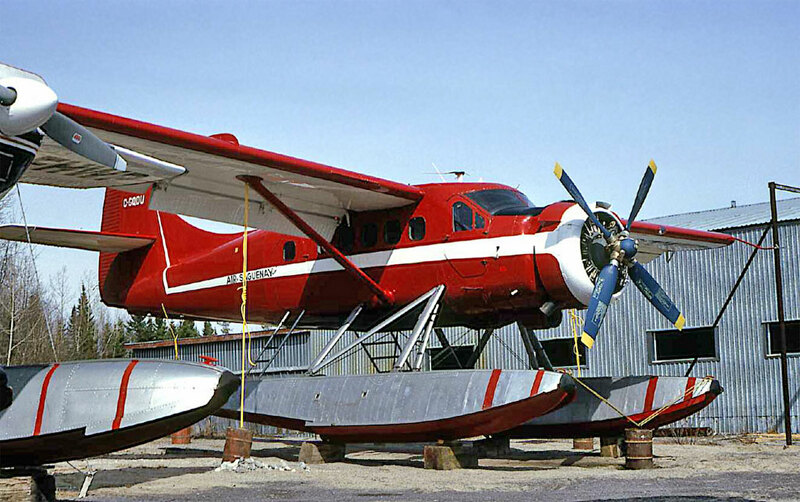 QDU was one of two Air Saguenay Otters converted with the PZL engine, the other being C-GLFL (329). The company found that although take-off distance and climb rate performance were dramatically increased, the maximum payload remained the same. Accordingly the company’s re-engining programme with the PZL was limited to those two Otters. 10 July 2001. Several pilots reported hearing an ELT signal in the Baie Comeau area. Montreal ACC advised RCC Trenton. The signal was coming from Lac Sebastien, fifteen miles from Bagotville. A Griffon helicopter proceeded from CFB Bagotville to the scene but the signal was turned off before it arrived. It was determined that the signal had come from Otter QDU. The ELT switch had been turned on accidentally during maintenance of the aircraft. 12 June 2004. QDU reported inbound to the Wabush water-drome, Labrador with suspected damage to one of its floats. No emergency was declared but it received assistance from Cessna 180 C-GNHU which had just departed. No visual damage could be detected from the air and QDU landed safely. 30 July 2006. FSS issued a departure advisory to QDU departing Wabush. The pilot of the Otter queried if the FSS was in contact with a Cessna U206 on finals, but FSS confirmed no contact. QDU remained on the lake until the Cessna landed. The pilot of the Cessna C-FQXF acknowledged failure to contact the FSS as per mandatory reporting procedures. As at summer 2016 QDU remained in service with Air Saguenay, clearly a valued member of the fleet.